Starring: Ben Affleck, J.K. Simmons, Anna Kendrick, Jon Bernthal, Cynthia Addai-Robinson, Jeffrey Tambor, and more. 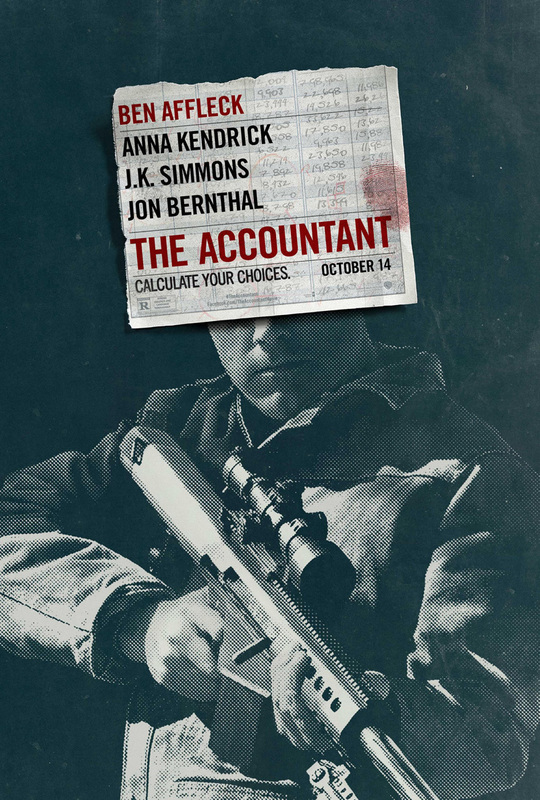 Usually I am excited to extreme measures for movies that are Marvel related or when I am a huge fan of the actor or actress in it, but ‘The Accountant’ became a special case. I have been excited for this movie since I first saw a trailer for it a couple months ago and ever since, I have been EAGERLY anticipating getting the chance to view this movie. I do not know if it is the mystery behind who Ben Affleck was playing, the heavy hitting cast, or the high octane energy of the film, or maybe even it was a combination of it all but regardless, ‘The Accountant’ pulled me in from the start and the time has come that my desire is satisfied. With my recent viewing of this flick, here is the review not only some people may have been waiting for, but instead, I have been waiting to make. ‘The Accountant’ follows the mysterious life of Christian Wolff (Ben Affleck). To the public, he is an everyday accountant but in the shadows, he conducts classified business with international crime lords which garners the attention of the government whom of which begins a covert investigation on him, headed by Ray King and Marybeth Medina (J.K. Simmons and Cynthia Addai-Robinson). As Christian’s true identity is explored, he becomes increasingly dangerous and lives become at stake. My high expectations for ‘The Accountant’ was satisfied 100%. This movie was so intelligently done and was absolutely investing from beginning to end. From the very opening moment, I was gripped into the story and did not break out of the hold until credits rolled. The mystery, the action, the intelligence of this movie is done so well, I can not be more fulfilled in what I could want in a film… Everyone in ‘The Accountant’ had a rightful fit and knocked home-runs out of the park when they were on screen. Easily, Affleck had a performance of a lifetime, for me. His secretive yet extremely intelligent and underlying charismatic character of Christian Wolff is done to perfection. Jon Bernthal, once again, and I will not stop posting this until I see a performance I am not impressed with. does phenomenally well with the character he portrays of Brax. His confident intensity is prevalent in nearly every character he plays and it is done so well again in Brax. Now in attempt to not lengthen this section even more, I pay great respects to J.K. Simmons, Anna Kendrick, Jeffrey Tambor, Cynthia Addai-Robinson and everyone else because every name did so well to contribute to this story. No one felt unnecessary… My only negative points come from minor spoilers of the film, so if you would be interested to discuss, feel free to contact me but otherwise, the negative points do not persuade me enough to feel differently of the film as a whole. It was too strong of a movie creative wise and performance wise for minor issues to take too much of a position in my stance. Highly recommended and one of my favorites of the year. Additional Appreciation and Notes: I felt strongly for this movie on a point that goes beyond the story and the characters. A point that any person with any spectrum of Autism has the capability to live a full and successful life. While I am not saying “Christian Wolff” is an ideal role model, he is portrayed to be a highly advanced mathematician and an expert accountant, while still going through his ways of living with his case of Autism. As a way of giving what I can to the case of awareness to Autism, click here to visit Autismspeaks.org. Where you can donate to the foundation and follow my path.